Here's the card I posted to the Paper Maniac blog yesterday. Here's my card for this week. I made this using the Card Positioning Systems sketch from this week. I'm pretty much in love with my new Hero Arts Wish You Were Here set. You can make it very masculine like I did here or with the chandelier and the other chairs, it can be very feminine. I colored this image with Copics. Then I paired it with some Graphic 45 papers. LOVE your card! 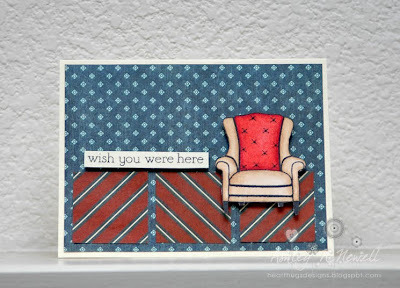 That is the perfect sentiment to go with that wonderful chair. Great use of the CPS sketch.